The preperation for Argentina to this World Cup has been going in the worst possible way. First, the starting keeper who would have been the undoubted first choice Romero got injured. Then followed Manuel Lanzini who also would have been a starter in the midfield got injured and was replaced by Enzo Perez. And now the latest reports says even Benega is doubtful; he may not be a starter but definitely would have been th first change. Add to that Bigilia fitness doubt,Aguero coming from injury; Argentina is going into the tournament like the same way they qualified - 'Total Mess'. Despite all these setbacks,Argentina fans have not panicked nor you could find panic discussion in any of the social media outlets. If this was happened to any other team, we could have seen extreme nervousness building up but not for Argentina. That's because the fans of Argentina have already concluded that their hopes lies with one man's form - Lionel Messi. Their qualification campaign itself was a great example - How Argentina fared without Messi and with Messi! Will Argentina be able to Top Group D? Group D have Argentina, Iceland, Croatia and Nigeria clubbed together. Out of all the group this has to be one of the toughest; considering how disjoint all these teams are this may be even referred as "Group of Death". It's each of these teams' weakness that makes the group one of the most competitive. In normal situation, considering the talents at disposal in Argentina team; everyone expects them to top the group. But considering that Argentina looks like Messi and ten other players, it will depend on Messi to get them to the top of teh Group. And it is essential for Messi to take them to top as it will avoid facing France in second round and that's crucial. Argentina opens their World cup campaign against Iceland on 16th of June. The second game is against Croatia on 21st and third against the familar opponent Nigeria on 26th June. For Argentina each of these match are must win as this is the only time they get to gel together as a team; which they have failed as a unit so far. Argentina should ideally get four matches before they get to face Spain in the Quarter-Finals. And their hopes against bigger opponents will depend on how they work as a team by that point. To top Gropup D won't be an easy task but Lionel Messi needs to find a way out. He cannot depend on anyone else other than Di Maria and may be Aguero for getting the attack right. And he would relaly hope Mascherano and Ottamendi would be able to form a solid defense guarding Argentina. For Argentina, the entire hope lies with one man, their Captain. It depends on how he would be able to paly teh role of Play maker and striker together with the same precision throughout the tournament. It won't be easy as Opponents would also know clearly that if they stop him, they efefctively stops Argentina. There is nothing in the midfield which allows Argentina to work if opponents stop Messi from organising attack. May be in attack, he may get a bit of support from Di Maria and Aguero; that's what everyone is hoping. But if that doesn't materialize he may have to do that job also alone or with half support. Just like the final qualifier against Ecuador. Messi would be hoping that by the time knock-outs come the team is able to find some kind of identity to support him. That's essential for his hopes of winning the World Cup. 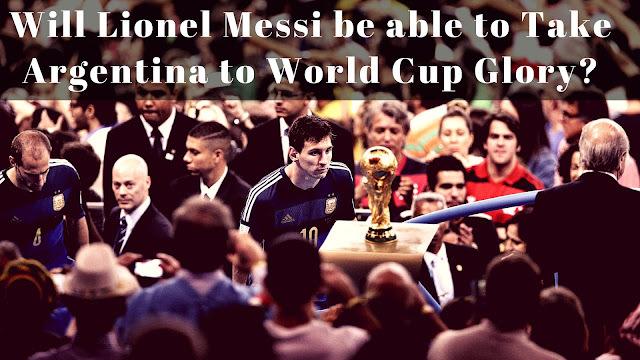 Winning any of the group matches will be tough for Argentina. The first match against Iceland will see a well oiled team facing Argentina, who looks like completely disjointed at the moment. Then comes the toughest match against Croatia, who with Modric and Rakitic in midfield could destroy Argnetina to pieces. Then comes Nigeria the eternal problem opposition for Argentina. For Argentina they need a perfect series of results to get them to their most desired third World Cup. And that dream will definitely lies with one Man, Lionel Messi. Will the MeSSiah be able to get Argentina to the third Wolrd Cup?